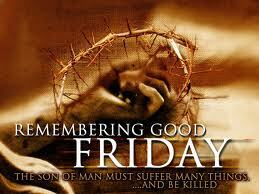 Good Friday is the solemn commemoration of the passion and death of Jesus Christ. This day is the most sorrowful of any day in the history of the world for Christians. Jesus, innocent and without sin, freely offered His life for the redemption of the sins of the entire world. We must conform our lives to goodness. We must sacrifice the pleasures of sinfulness so that we may be united with Him in Heaven. For though He died to redeem our sins, we must still accept this gift in our lives. We must live for Christ.